Good beer takes time. Great beer takes even longer. “Oak-aging” is a common practice in the production of wine and whiskey, but has recently become popular in the beer industry. As the beer rests in the barrel, it becomes infused with the oak wood flavor and a hint of the vessel’s previous occupying liquid. The porous oak wood will also expose the beer to oxygen, which will soften the astringency and mellow the flavors. Beers of higher alcohol content benefit more from longer aging periods, and thus are more appropriate for this process. Whiskey casks are no doubt the most popular aging vessel for beer. Sixteen compounds have been identified by the Scotch Whiskey Research Institute in Edinburgh as the flavour standards for the profiling of whiskey flavour. These include guaiacol (smoky), vanillin (vanilla), and the so-named whiskey lactone (coconut). Innis & Gunn is one of the first to market such a product, claiming that their oak-aged beer was “born by a fantastic and delicious accident”. William Grant & Sons Ltd., a family-owned Scottish whiskey distillery, was looking to produce a blended whisky with the distinct bitter finish of hops. The distillery contacted Dougal Sharp, head brewer at Scotland’s largest craft brewery, to create a beer that would infuse the oak barrels with the flavor of beer. The resulting whiskey was okay, but the waste beer from the cask (enthusiastically sampled by the employees) was exceptional. 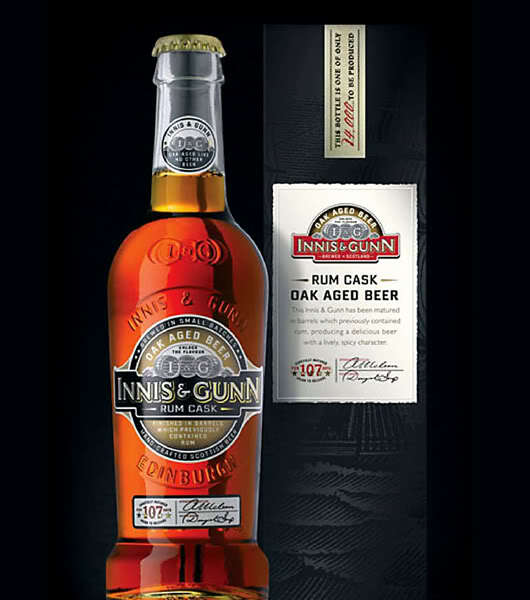 The beer was marketed under the label “Innis and Gunn”, the middle names of Sharp and his brother. The brand has been remarkably successful, and has also released varieties aged in Irish whiskey barrels and rum casks. 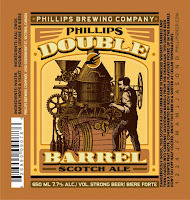 The Phillips Brewery out of Victoria has some excellent examples of barrel-aging. 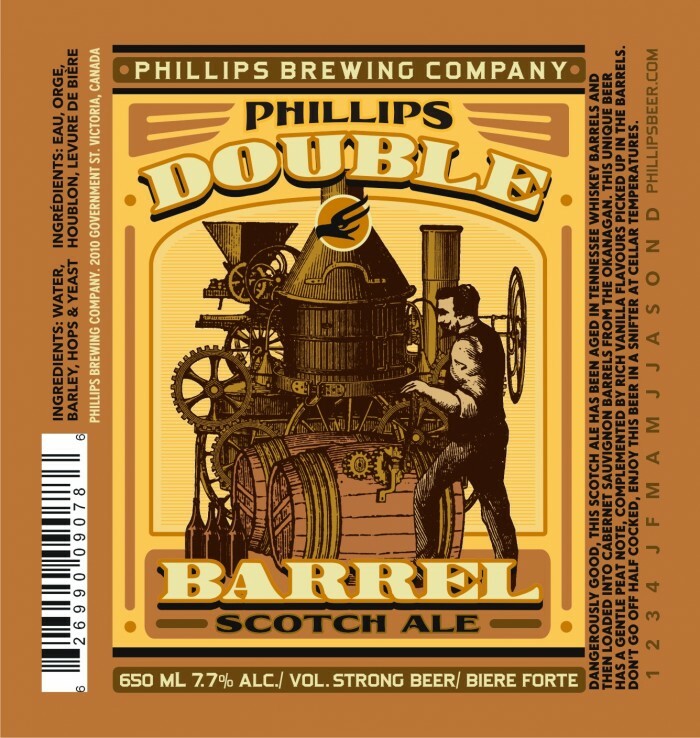 Take the Double Barrel Scotch Ale – a beer aged in both red wine and scotch barrels. The beer picks up flavor from both casks, resulting in a flavourful brew with notes of peat and vanilla. Also try the Hammer Barrel Aged Imperial Stout, aged in bourbon-soaked American oak barrels. This recipe uses one bottle of Innis & Gunn Rum Cask Ale. There will be a little beer left in the bottle after making the bread and glaze. Don’t let it go to waste. Grease and flour a 9x5” (2L) loaf pan, or line with parchment paper. In a bowl, sift together flour, sugar, baking powder, and nutmeg. Set aside. In a separate bowl, finely mash the bananas. Add the beer, rum, egg, and oil to the banana mixture and stir to combine. Pour banana mixture into dry ingredients and mix gently until just combined. Fold in walnuts if desired. Bake in preheated oven for 1 hour or until a toothpick inserted in the centre of the loaf comes out clean. To make glaze, stir together beer and brown sugar in a small saucepan. Bring to a boil, then simmer over low heat until mixture coats a spoon. Let cool and refrigerate before slicing for best results. Lee, K. M., Piggott, J. R., & Paterson, A. A. (2000). Perception of whiskey flavour reference compounds by Scottish distillers. Journal Of The Institute Of Brewing, 106(4), 203-208.